Originally from Iowa, Dana Stephens started dancing at three and began performing on stage professionally when she was nine years old. By the time she finished high-school she had already performed many coveted female roles for numerous theatres nationwide. She studied Vocal Performance at Oklahoma City University which is world-renowned for its demanding and professional vocal training, producing award-winning vocalists such as Metropolitan Opera legend Leona Mitchell, Chris Merrit, Marquita Lister, Sarah Coburn, and Broadway superstars Kristin Chenoweth and Kelli O'Hara.While in Oklahoma she also studied dance under OCU's Patricia Oplotnik and Billie Thrash winning numerous awards in competitions. In 2007 she became teaching certified in Speech Level Singing (SLS Level 1) and KinderMusik. In addition to training and experience Dana owned, operated and taught piano, dance and voice at Academy of Music & Dance in Oklahoma. She has worked and collaborated with multiple, award winning recording artists. Many of her past students have recorded albums that have been featured on soundtracks or received radio air time and several are currently acting in shows in New York, dancing in Disney, performing in Branson, MO, or acting in film in California. Dana Sparks Welch started dancing at the age of six and hasn’t stopped since. She took classes, conventions, workshops and competed as much as she could. She has studied ballet, tap and jazz extensively throughout her career as well as Hip Hop, Lyrical and Musical Theater. Dana was also a competitive gymnast , cheerleader and president of thespians in high school. Throughout her years in school and early years of college she won numerous awards and performed throughout the US and Europe including The North Sea Jazz Festival, and in various shows such as "42nd St.", "George M.", "Pippin", "Working" and "Noises Off", among others. At the age of 19 Dana acquired her childhood studio and owned and operated Dance Center of Deer Park for 18 years before she began teaching for TUTS/River. Dana teaches all over Houston and surrounding areas and has judged numerous dance competitions such as I Love Dance, KARR, Showstoppers and Champion Dance, which she continues to judge every year. Dana choreographs shows for local schools and theaters ( The Wiz, Oklahoma, Godspell, Adams Family, Beauty and the Beast). She also choreographed a group of dancers to perform a 30 minute show on Carnival Cruise Line. Currently she teaches at The River and the Humphrey School of Musical Theater as well as Classes in the Community and various other projects. Dana loves to share her passion for dance and musical theater with students of all ages and abilities! She is an especially proud mom of two children. Mark is originally from Houston, TX and is excited to be joining the Spark team and providing education to the next generation of performers. Mark is a recent graduate of the Weitzenhoffer School of Musical Theatre at the University of Oklahoma with a BFA in Musical Theatre, and is also an Alumnus of the Humphreys School at TUTS. Over his past 10 years of performing he has traveled Bi-coastally and many places in between to perform. Performance credits include: OFF-BROADWAY: Kissless (Cory) REGIONAL: Lyric Theatre of OKC: Assassins (John Hinckley), Oklahoma City Rep/ATC Tulsa: Pryor Rendering (Dewar), SRT: Merrily We Roll Along (Franklin Shepard), Rock of Ages (Stacee Jaxx), Nice Work if You Can Get it (Duke), Sooner Theatre- Bonnie and Clyde (Clyde)… and More. Mark has found himself spending lots of time on the theatre education side as well. In addition to working educationally at places like The Humphreys School, Stageworks, and The River Foundation, Mark has worked along side artists such as Adam Pascal, Laura Osnes, Wesley Taylor and more. Mark hopes to bring his knowledge as an actor and singer to young artists in many different styles and techniques of performance. Originally from Utah, Amanda has been acting and teaching in the field of theatre for over ten years! Amanda received her BFA in Theatre Performance from Westminster College in Salt Lake City, Utah, and her MFA in Acting from the University of Florida. She has worked and trained with many artists including Tony-Nominated actor Malcolm Gets, and internationally acclaimed actor and mime Yanci Bukovec. In 2017, Amanda became a certified actor combatant in rapier and dagger and unarmed through the Society of American Fight Directors, and the British Academy of Stage and Screen Combat. A few of her notable acting credits include: The Beaux Stratagem(Dorinda), King Lear (Goneril), Who’s Afraid of Virginia Woolf? (Honey), A Christmas Carol (Mrs. Cratchit), Curtains (Niki), Godspell (Gilmer), and Spring Awakening (Woman). She has experience acting in a number of different styles and genres, but her true passion lies in the works of Shakespeare and in classical theatre! Amanda is thrilled to join the Spark family and excited to teach and be taught by the amazing youth of the Houston area! Victoria’s extensive background in ballet, tap, jazz, hip-hop, musical theatre and acting make her a jack of all trades in performing arts. She’s been trained in teaching introductory to advanced levels for the past several years from studios all over Houston. Victoria’s passion has led her to uphold roles as director, choreographer, assistant director, technical director, and camp coordinator over the past two years at Cypress Academy of Performing Arts. In addition to productions, she has also coordinated and choreographed two flash mobs and a wedding. Victoria is currently looking forward to working with members of the Spark community! Raised in a performing arts household in Houston, Katie was trained in piano, voice, acting, visual art, and dance as a child. Though she was first an on-camera actress, she discovered a love for musical theater by age 9 and began performing on stage. She attended HSPVA for dance, then was invited to be a Director/Choreographer's assistant at HITS in 2000. She taught acting and dance at Main Street Theater, expanding their outreach program to at risk youth in 2001 before pursuing a career in mental health. Katie worked for both the Arizona Department of Behavioral Health Services and the Regional Behavioral Health Authority during which time she piloted programming for at risk youth. In reprieve from her clinical work, she developed performing arts programs for at risk youth within the Quality Care Network as well as for other non-profit performing arts agencies. While still in Phoenix, she taught on-camera acting for Elizabeth Savage Talent, musical theater for Desert Foothills Community Theater, and was the resident Theater/Dance Teacher for Bella Vista Private School. Returning home, Katie resumed teaching while acting as the Senior Associate Director and Choreographer of Aeon Theatrix. She has since taught at Wildfish Theater, Main Street Theater, and The Shlenker School, among other places, and has been a guest teacher at TUTS and Houston Ballet. Katie now feels honored to be counted among the talented teachers at Spark and is excited to be sharing a passion for the arts with such truly amazing kids. Michelle Bowen is new to Texas but feels right at home here! She and her husband (Brad), and their six children moved from Idaho in August-- immediately following the final curtain on their most recent family production, Tarzan. Michelle has been directing and teaching Children’s music and performing Arts for the past eleven years and is excited to “get going” again! She has been the choreographer for many productions, but her favorites include; Bandito Rides Again, Tarzan, Aladdin, Wizard of Oz, and Beauty and the Beast. Her love for the stage grew when she was cast in Annie, Hello Dolly, Babes in Toyland, Joseph and the Amazing Technicolor Dreamcoat (where she got to know her DREAM guy and future husband, Brad...), Bye, Bye, Birdie, Noteworthy Show Choir at ISU, and more recently Oklahoma and Thoroughly Modern Millie. She is the former chairman of Blackfoot Junior Miss (Distinguished Young Women) and enjoys doing custom graphic design work and photography. She has her own little “drama club” at home with six beautiful (and talented) children who also love music and performing. Desi Stephens is a Musical Theatre Major from Manhattan School of Music in New York City. She has been performing locally in the Houston area for the past four years in musicals, plays, competitive dance, and Shakespeare. In 2014 she became certified in Stage Combat. Desi was cast in the professional production of Hairspray at The MUNY in St. Louis Missouri where she was directed by Tony nominated director Dan Knetchges and worked along side award winning actors Bryan Batt (Mad Men), Taylor Louderman (Peter Pan Live) and more! Desi has also appeared in as a model in Vogue magazine and as an actress in the HBO series The Deuce. Aside from performing she's choreographed productions for HFAC (Zombie Prom, Seussical, Dinosaurs Before Dark) and Spark (Beauty & The Beast, Lion King, Seussical, Once On This Island). Desi is very excited to be back home in Houston this summer to share her passion for the arts with Spark students before returning to pursuing her own creative aspirations in New York City! Eric Domuret is an experienced actor and director both nationally and abroad. Eric received his BFA in Acting from Texas Christian University and an MFA in Theatre Directing from Middlesex University in London, England. Some of Eric’s directing credits include Macbeth, You’re a Good Man Charlie Brown, The Miracle Worker, and The Crucible. Eric had the privilege of directing an original work Hildeguard: A Song of Surrender with Femme Sol Theatre Company. He has also written and directed Ismay’s Inquiry which was performed at Studio 7 in London, England. Eric was the fight choreographer for the Trinity Shakespeare Festival in Fort Worth for four seasons. His choreography for Macbeth was chosen by Mark Lowery as Dallas/Fort Worth theatre’s best choreography for the year. Acting credits include Les Miserables (Jean Valjean) HFAC, Plaid Tidings (Jinx) MJR Theatricals, The Best Christmas Pageant Ever (Bob Bradley), Duck Variations (George), Mountain Language (Sargent), Forever Plaid (Jinx), Forever Plaid (Frainkie) Troupe America Tour, Titanic: The Musical (Barret) Lyric Stage, Side Show (Terry Conner), Fool for Love, As You Like It, Henry V. In August of 2014 Eric will be playing the role of Dan in MJR Theatrical’s production of Next to Normal. Eric is committed to theatre education. A proud father of five, Eric Domuret truly has a heart for sharing his passion with students of all ages. He had the privilege of being trained by Leon Rubin and Dame Janet Suzman of the Royal Shakespeare Company. He has studied playwriting with playwright David Edgar. Eric has also studied Meisner acting and acting pedagogy with Larry Silverberg of the True Acting institute. He has taught theatre at a number of private institutions and universities, and was a full time theatre teacher in the Texas Public School Systems for six years. In December, Eric will be presenting a workshop on the Greek Theatre and contemporary acting techniques at the IUGTE International Theatre Conference in Tuscany, Italy. Eric is currently the Assistant Professor of Drama at the University of St. Thomas here in Houston. You can contact or keep up with Eric on his website www.domuret.com. Mackenzie Haley is a native Texan who was raised in a family full of musicians and performers. She is a singer-songwriter, trained theatre actress, guitarist and professional percussionist. Mackenzie began teaching drum and guitar lessons 4 years ago and thoroughly enjoys watching her young students grow. Her areas of expertise include acoustic guitar, snare drum and Latin percussion. Mackenzie began acting on stage at the age of 10. Her family helped to found Tex-Rep, a Texas-based community theatre program. She has acted in over 15 stage productions. Cassidy Richards started dancing at the age of six in a local studio called Dana's Dance and Gymnastics under the direction of Dana Keuhl and Kara Nordin. After developing a love for dance at a young age she went on to continue her education through San Jacinto South, where she majored in dance with an emphasis in Mondern. There she became a member of the San Jacinto dance company where she had the opportunity to travel and perform in shows for; American College Dance Festival Association ( ACDFA), Dancers Against Cancer, Broadway Dance Center in New York and Houston Arts Festival. In 2012. Cassidy became a member of Vibe Dance Company where she had the opportunity to be in pieces for Tanoya Smith, Tyler Davis and Megan Sannet. Cassidy has danced in Music videos, concerts and continues toI learn and take classes as often as she can. Breeya Harrison is twenty-four years old from Houston, Texas. She acquired her BFA in Art with a specialization in Graphic Design and BA in Theater with a specialization in Dance from Barry University in Miami Shores, Florida in December of 2015. She started as a Hip Hop dancer but her passion for dance really began to blossom when she joined the dance team in High School. Dancing on a team and a variety of dance styles was a challenge but due to her dedication, persistence, and hard work, Breeya's dance and technical abilities improved drastically. Over the years, she advanced from a team member to holding two dance officer positions: Third Lieutenant her junior year and Second Lieutenant her senior year of high school. She began university with Dance as her minor but added it as a second major her junior year. She was elected as the Captain of the Barry University Dance Team from2013-2014 and 2014-2015 school years. She was also a member of the dance company at her university, B.U.R.D.E., (Barry University Repertory Dance Ensemble) from 2012-2015. During her final semester of university, she choreographed her senior dance showcase. For the showcase. She completed all choreography, costuming, scheduling of photo-shoots, as well as the planning of the lighting for the show and all graphic design work. She used the show as a platform to speak to a large group of people about life issues and call them to use their talents to positively impact others. Breeya has performed and/or choreographed for an array of events such as football/basketball games, dance concerts, social justice events, homecoming, community events, competitions, Channel 6 Spirit Week, Downtown Disney, and pep rallies. Post graduation she has taught contemporary, hip hop, jazz, Barre, and dance fitness classes as well as choreographed solos, duets, trios, and dance team routines. Breeya describes her style as quirky but powerful. She prides herself in being versatile dancer and choreographer. Her favorite styles are Hip Hop, Jazz, and Contemporary. San Jose Ballet School in Silicon Valley CA (September 2008 - June 2009). Beauty, and Coppelia. She most recently worked at TKB Ballet and is excited to be continuing to share her love of classical ballet and technique at Spark. Gina Vazquez is an educator and visual artist from Mexico City. 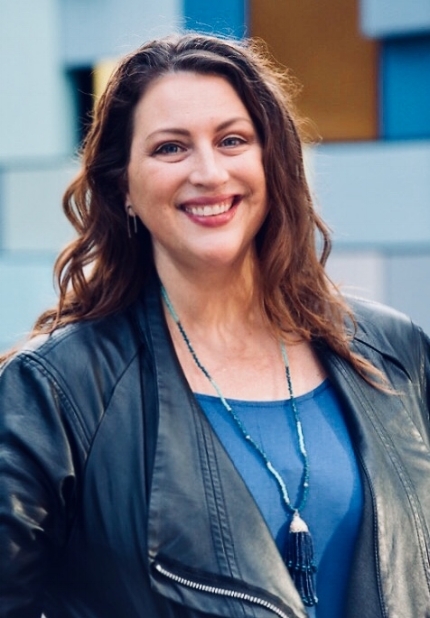 She has worked in both in private and public sectors helping to teach children, teens and adults in the educational disciplines of language, arts, and cultural awareness. As artist she is constantly exploring the possibilities that art, world history, folk stories and mythology offer to help develop creative expressions that are full of rich symbolic and multicultural language that help her audience to identify the common roots of our cultural heritage and to create a sense of community between people and cultures. Using a wide variety of media and techniques such as painting, sculpture, performance art, and body painting, Gina creates innovate ways of seeing more in ourselves, our cultures and our environment around us.